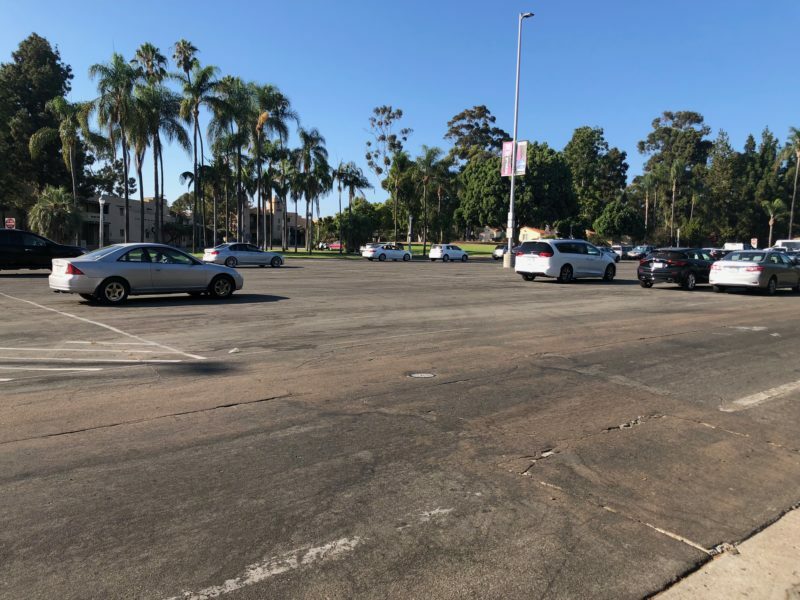 Balboa Park boosters are pushing a new, different plan to turn a decrepit parking lot in the park into a new public plaza. Of course, anything and everything that happens in Balboa Park is controversial, and this is no different, as Kinsee Morlan reported Tuesday. The plan is to take the parking lot that stretches from the soon-to-be Comic Con Museum to the San Diego Air & Space Museum and turn it into what would be called the Palisades Plaza. While it’s an initiative with renewed vigor, it’s not a new idea: it was featured in the master plan for Balboa Park adopted in 1989. But some key figures in the park think it’s a mistake to focus on anything other than the controversial Plaza de Panama project until it’s finished. That’s the plan to build a bypass bridge that would divert cars away from the central mesa to a new parking garage that will free up the surface lot behind the Organ Pavilion to be reclaimed as park space. Another park leader, Jim Kidrick, with the Air & Space Museum, says the Palisades plan is premature and the city should redo the entire park master plan to address the park’s greatest need: more parking. A city spokesman said there are no definitive plans to pursue it right now. But Vicki Estrada, who wrote the 1989 master plan, and others are holding meetings and kickstarting fundraising plans to make it happen as part of a broader goal of revitalizing that portion of the park, much of which has seen better days. Even Save Our Heritage Organisation, the preservation group that’s suing the city over the Plaza de Panama project, says it’s on board with the Palisades Plaza. For years now, artists have complained that as it gentrifies, East Village is becoming too expensive. The great irony, of course, is that East Village is pitching itself as a cool and artistic place to flock too. In the latest Culture Report, Kinsee Morlan looks at one building in particular where artists say they’re being priced out. It’s called, naturally, Art Center Lofts. The building currently houses the NewSchool of Architecture, and other small studios and businesses. The San Diego Housing Commission and the City Council will soon vote on updated contracts with nonprofits running the city’s three bridge shelter tents that reflect their struggles to move clients into housing. Through July, nonprofits running the so-called temporary bridge shelters moved about 13 percent of clients into housing – slightly up from the numbers reported in May but far short of the 65 percent contractual target set last year. The Housing Commission is scheduled to vote Thursday on updated contracts that set an interim 30 percent target that also broadens the definition of what’s included as a successful exit to include longer-term transitional housing. City Council members, some of whom have questioned if the city should continue funding the tents, will weigh in on the proposed contract changes next Tuesday. L.A. Times columnist Robin Abcarian spent a day trailing Democrat Ammar Campa-Najjar as he continues his underdog bid to oust Rep. Duncan Hunter, who’s been charged in federal court with crimes related to abusing campaign funds. Campa-Najjar comes off like any aspiring pol: He tells some cheesy jokes, and plays up his personal story. inewsource rolled out a website that has data on campaign spending going all the way back to 2007 and is updated nightly. KPBS explores “illegal charter boats” that are operating in San Diego Bay, carrying passengers on tours or fishing trips without the proper licensing.